Submitted by jaw38 on Fri, 07/26/2013 - 22:21. Why is Mike Lee left off the list of possibilities? He has done better as a write-in than several who are on the possibility list. Now there is no option of a write in. If we want to see who might win, we should leave the options open at this point. Surely we don't want to leave the choices to back room leaders and get candidates like we have had. Is there even one conservative wanting to see McCain lead the ticket??? Submitted by dspears2 on Fri, 07/26/2013 - 00:15. I could enthusistically support any of this weeks top 5, however I'd lean heavily in favor of palin for her experience as a governor and staunch supporter of true conservative values as well as Dr. carson. Any one who saw his speech that demonstrated his character and the backbone to call out with laser focus the error of this administrations direction, while facing the architect of that direction; and without fear of going against the grain of the supposed position of his fellow black americans-- as well as providing well thought out solutions; or at least tremendous starting points for action prove to me that he is a contender. Ted Cruz is demonstrating his intellect and backbone as well. Submitted by david53916 on Wed, 07/24/2013 - 13:57. You have one, and only one choice off of this list. And that is Kentucky Senator Rand Paul. 1. Don't shove (and cheat) a candidate through. 2. Don't alienate a major bloc of voters within your own party. 3. Don't let someone without any out-of-party appeal win the nomination, unless he/she truly earned it. I like Palin, and would likely vote for her. Most of my fellow Ron Paul supporters (aside from the "purists") would at least give her an honest chance to earn their vote. But nro out-of-party appeal. Paul supporters are likely to at least consider Jim DeMint, but leaving the Senate kind of took him out of people's line-of-site. Ted Cruz? Has a chance, but he is still relatively unknown. Maybe he's a better down-the-road option if it comes to that. Submitted by hrh32 on Thu, 07/25/2013 - 11:32. ...but if they were such a big block, then Ron Paul would have been president in 1988. Yes, what the GOP did to the Paul supporters in 2012 was reprehensible. As was what they did to Sarah Palin, her supporters, and the tea party. But Senator Rand Paul has no executive experience. Let him run for Governor of Kentucky and see what the difference is between being one of 100 and being The Man. For reference points on this, See: former U.S. House Reps, Bobby Jindal and Mike Pence. Senators rarely make good presidents. It's not JUST the ideology. It's the ABILITY to execute and administrate. Representatives and Senators do very little of either. Which is one of the reasons Ron Paul was never president. And saying we have "one and only one" choice for president is both fallacious and offputting. You won't win people not already on board the Paul train over with such emphatically extreme statements. Some Palin supporters act the same way. With the same response from people who aren't already on board the Palin train. Such extreme statements are offputting and unpersuasive. Remember, for example, how the GOP Establishment browbeat us with the extreme statement that "Mitt Romney is the only electable candidate"? Were you persuaded by the obnoxious repetition of this meme? I see by your comment here that you were not. 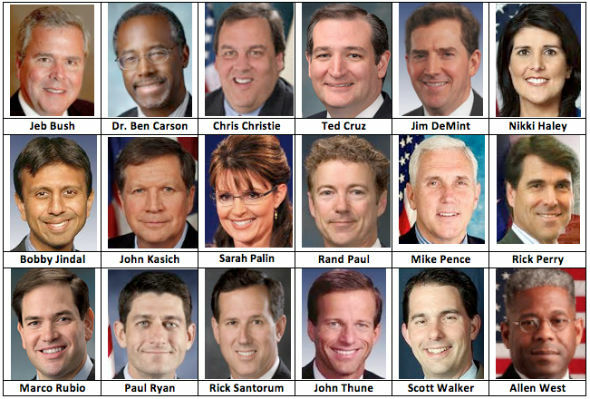 While Palin is my first choice, I would support some others, such as Jindal, Pence, maybe Perry. In other words, governors who have proved they can administrate. Submitted by miamaryanne on Wed, 07/24/2013 - 20:22. If she will run I am behind her "ALL THE WAY", as far as I am concerned she is the " best one" to turn our country around!! GO SARAH!!!!!! Submitted by rtoberl on Mon, 07/29/2013 - 17:44.